Giant chewy cookies with chocolate chips and butterscotch morsels. I don’t have anything clever to say about making these cookies. Nothing interesting happened when I was cooking them. I didn't catch anything on fire. I didn't drop the flour canister on my big toe. No one needed CPR while cookies were in the oven. And you know what? Thank God. Everything’s been so mind-blowingly crazy lately that a little dose of normal was welcome! It’s too soon to tell you all about it yet because I don’t know which way things are going to go. But I think in a week or so I’ll either be telling you about something that almost happened or I’ll be telling you about something that is going to happen. Stay tuned :) No matter which way this thing goes, I've got some stories to tell you about the last two weeks that’ll curl your toes! In the meantime, make yourself a batch of these giant, chewy, delicious cookies! 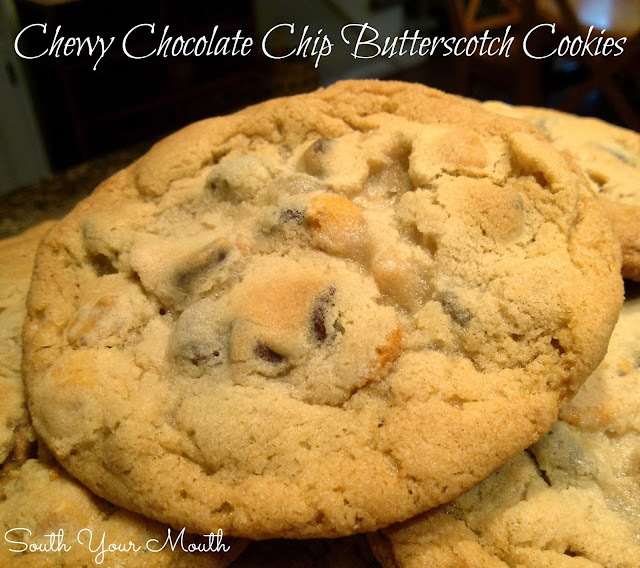 You can substitute whichever chips or morsels you prefer for the chocolate and butterscotch, just make sure you have three cups total! Combine brown sugar, sugar, butter, eggs and vanilla in a stand mixer fitted with a paddle attachment or large mixing bowl and mix on medium speed until well blended. Combine flour, baking soda and salt in a separate bowl and stir to combine. Add flour mixture to sugar mixture and continue mixing until all ingredients are incorporated. Add chocolate chips, butterscotch morsels and nuts then stir to combine. Using a tablespoon, drop heaping spoonfuls of dough onto an ungreased cookie sheet and bake at 375 degrees (350 if using a dark colored pan) for 10-12 minutes or until bottom edges start to brown. I just made these this morning, and oh my they are awesome! I did not have the full 3 cups of chips, so I improvised with 3/4 cup butter scotch, 1 cup semi sweet chocolate, and 1/2 cup Milk Chocolate. Still came out great!